Susan Delatour was born on Long Island, New York in 1954. She studied at the University of Oregon before receiving her B.A in Arts, Crafts and their History from the University of California, Santa Cruz in 1976. Susan also studied at the Sun Valley Centre for Arts and Humanities in 1976-77. She moved to Banff, Alberta, Canada in 1978 and studied and worked for two years at the Banff Centre for the Arts. In 1980-86, Susan and Steve LePoidevin owned and operated Clayform Studio in Shawnigan Lake, BC. They moved to Princeton, BC in 1987, where they raised two sons. In 1996-97, Susan and her family lived for one year in an ancient village in Scotland, on the East coast of Fife. She was most influenced by Britain’s unique and varied architecture, rich and diverse landscape and its antiquities. In August and September 2001, Susan returned to Scotland on her own to Kilmartin, a small village situated in the west. This area was filled with ancient sites, including standing stones, cup and ring marks, cairns and burial grounds. Susan spent six weeks doing an artist residency at Kilmartin House, a museum devoted to the study of the ancient people and their environment. Susan presently is working on a series of work on paper and in clay with a “Bridge” theme. Visit Recent Gallery to view. More to come. Susan resides in the beautiful Similkameen Valley in Princeton, BC, 31/2 hours drive east of Vancouver. 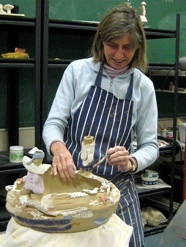 Her studio /showroom displays her whimsical clay sculptures as well as mixed media ink paintings. The showroom is open by appointment by calling (250) 295-0527. If you wish to purchase any of Susan’s work, please email her at susan@susandelatour.com for more information.